My maternity leave gave me the opportunity to witness a great summer of British sport from the comfort of my sofa and it was guilt free because I was incapable of doing much else. I watched Sir Bradley Wiggins win Le Tour and I watched all of the Olympics in London. I should’ve been delivering my baby on that super Saturday 5th August but despite high emotion, she stayed in comfort, not even a twinge, she wouldn’t move and was later delivered 2 weeks late. Shortly after the Olympics finished they announced a public event, a legacy event. The Prudential London Surrey Ride 100, a road cycling event that would take in most of the Olympic road race route for amateur cyclists. Before my pregnancy, I was a fairly keen road cyclist and I’d ridden a few cycle sportives but I’d never ridden further than 60 miles. 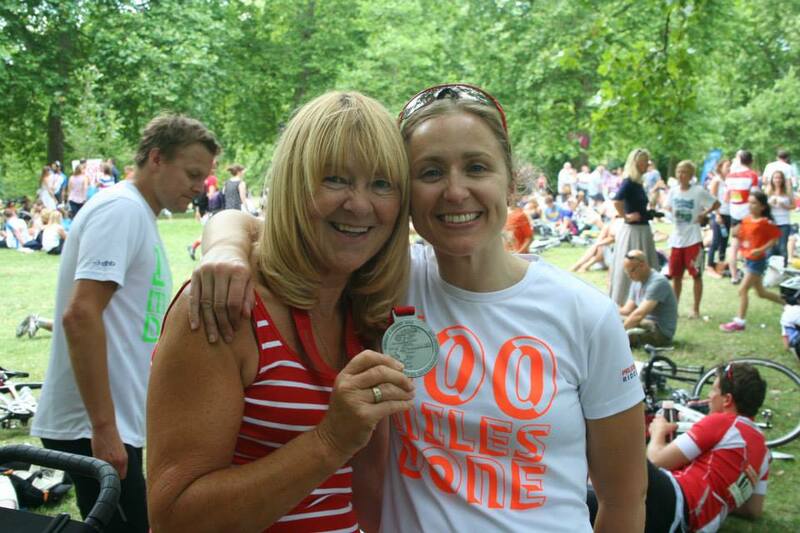 In secret, from my family, I entered the ballot for Ride London 100. I thought it would be a great motivator to get my fitness back and a goal to work towards. My baby hadn’t arrived at this point so the life-changing event hadn’t hit me either. I was in for a quite a few surprises, trying to build up my miles through the winter and spring weather and care for a baby at the same time but I always approached things with great optimism/naivety/innocence and so far I’d done OK.
Fast forward to February 2013, my baby is here and now 6 months old. She’s crawling, she’s said Mum for the first time and she’s a determined young lady. I’m away working in London and I receive the news that my application for the ballot was successful, I got a place in Ride 100. I’m filled with mixed emotions; I’m excited and scared but ready for the challenge. I’d been out on my bike quite a few times since Savannah was born but only short rides of no more than 15 miles. Fast forward again to August 2013 and I’m in the Olympic Park at 05:40 it’s a lovely, summer morning and I’m surrounded by cyclists all gearing up for the big event. I remember having a conversation with another cyclist, we talked about expected times. I said if I see 6 hours I’d be really happy but it could be closer to 7 hours. I gave a quick explanation that I had an 11-month-old baby, I’d shed 3 stone and ridden some seriously emotional miles to get where I was right now. Even if I can cross the line before the broom wagon I’d be happy. We wished each other good luck and said goodbye. My time finally came to cross the start line and the journey I’d been on came flooding back to me. All of those early rides in February, when a little bump felt like the Alps. 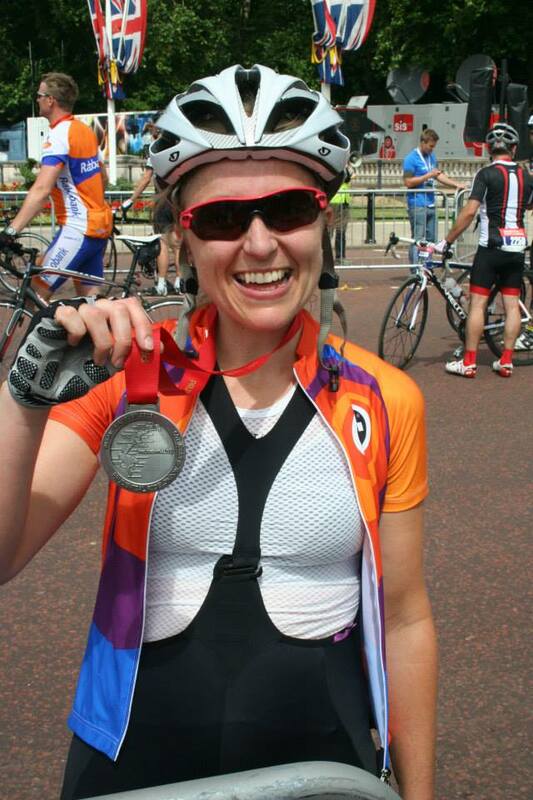 I’d ride with my sister, Lorraine and she enjoyed racing off and feeling like Victoria Pendleton. I’d want to phone a taxi, chuck my bike in a ditch and start crying, it was all very painful back then. 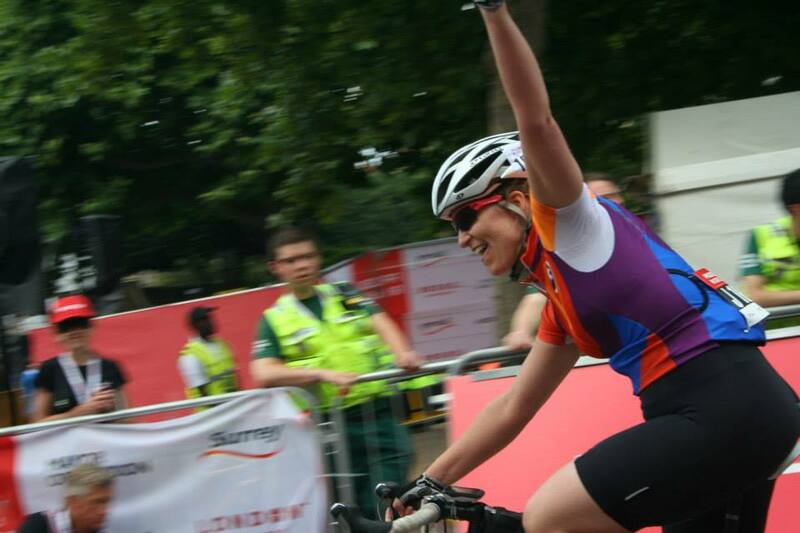 But here I was taking part in the UK’s biggest cycling sportive, 100 miles, lay ahead of me and every mile would be filled with memories of how I got there and lots of emotion. My family was waiting for me at the finish line, friends were checking Facebook waiting to see if I’d do it, all this was whizzing around my head as I pedaled away. It suddenly struck me that we were going at a pace I’d never ridden at before, we were in Richmond Park in somewhere close to an hour. The advice lots of more experienced cyclists had given me was don’t get carried away with the speed of the event, go at your own pace but it was impossible to maintain my own pace. I was being carried along by the buzz of everyone riding through London on closed roads, it was brilliant. About an hour into the ride my right hamstring started to feel really tight. Normally I’d use the first 12 – 15 miles to warm up but there was no warm-up today. I was also suffering from very sore feet. The previous day we’d enjoyed a family day out, starting at the Event Expo where I had to register and I’d worn flip-flops, we’d done a lot of walking and I’d now discovered my choice of footwear was a big mistake. So I was racing away with a very sore hamstring and the soles of my feet were burning with pain. Every few miles I’d stand up on my pedals, this would stretch out my hamstring and give me some light pain relief but I had to put all of this to the back of my mind and just keep going. The support from the side of the road from beginning to end was incredible and helped me push on and keep smiling, I received cheers of “girl power” “go lady rider” it was such a boost. Riding through Leatherhead and Dorking was a real highlight, the crowds were going crazy cheering for us and I can only imagine this is what it feels like for a pro rider in a real race, it really did power me on. 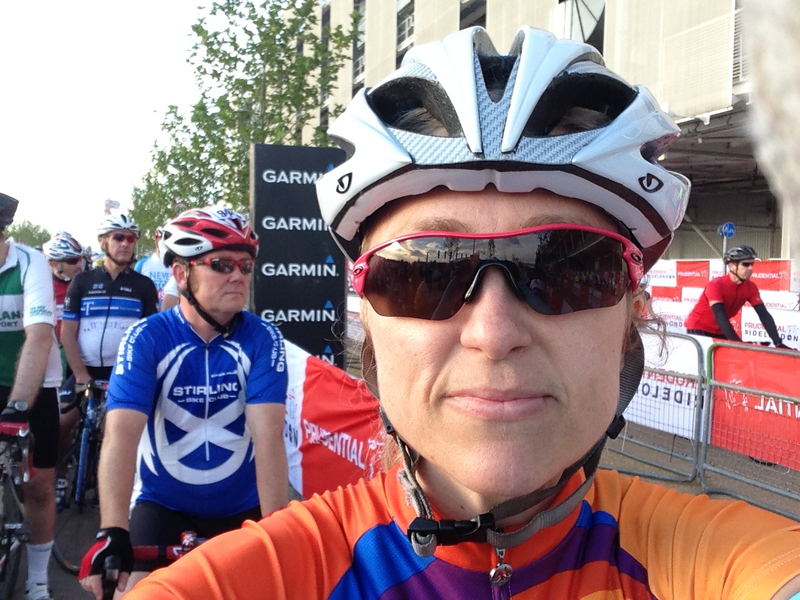 At around 70 miles, near the point of my longest ride ever (74 miles), my body was very tired. I’d gone way too fast and I was so ahead of any time I’d ever dreamed of completing the ride in. At this point my head took over, I told myself if I pedal faster the pain will stop quicker. It felt like my bike wanted to go left towards the kerb and pull up but my head wouldn’t let it and it kept going forwards. As I neared Wimbledon I knew the finish line was only one of my morning rides away, only a mechanical failure could stop me now but I don’t think I even thought of that. I was just full of positive emotion at this point and I was chatting to another cyclist, it was helping me pass the time and ignore the pain. As we neared Wimbledon my water bottles were completely dry and I noticed signs for the last refill station. There was still 9 miles to go so I had to stop and refill. I started heading along the last few miles and the smile on my face grew bigger and bigger. The crowds by this point were lining up along the route, cheering so loudly. Out of around 15,000 riders on the day less than 3,000 were women so we received lots of extra cheers. As I rode those last few meters before turning the corner and onto The Mall I had to almost pinch myself. The crowd was banging the branding hoardings in time to “we will rock you”, it was the most insane feeling. I gave it one last push and had a little sprint. I could see my Mum, Savannah, Niamh, Lorraine and my Dad. I’d done it, I’d ridden 100 miles and not only that but I’d done it in a really respectable 5hrs 27mins 36 secs. 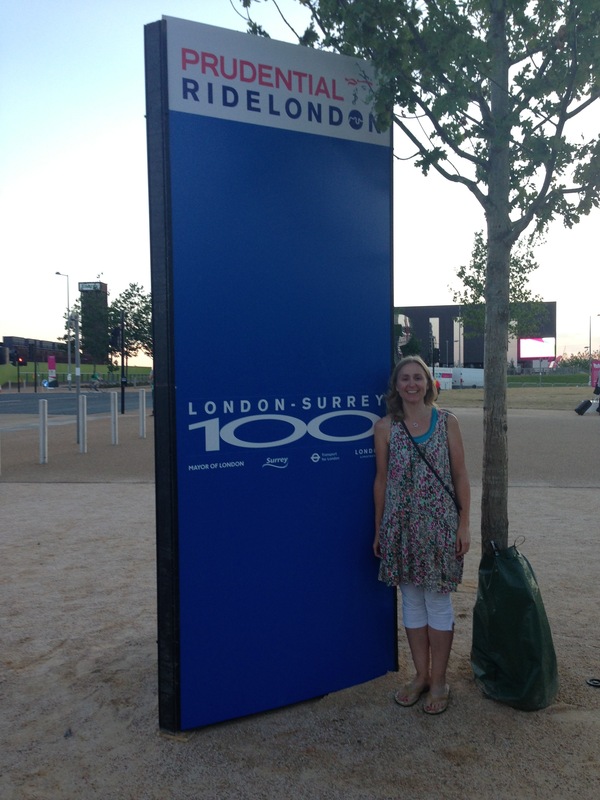 Ride London will be my first 100m event and I have to say I’m just a little scared…. Working full time with 3 children, there never seems to be enough hours to train! I was terrified last year but you’ve nothing to fear, the support from the crowds will carry you on through. I tried to stick to a plan last year but I was on tour most of June & July so I just did what I could. 2 or 3 10-15 mile rides and 1 big ride 40-60 miles is enough per week but if you can’t fit it in don’t stress. I always try and walk up stairs, escalators etc so when I’m not cycling at least I’m doing something. Keep in touch, let me know how your training is going. Are you on Strava? hi just read yr blog frm last year,3000women out of 15000 ! may just have remotivated me,have serious doubts, my legs are achy and tired,a tiny incline feels like im climbing the Alps,and worried im not quick enough,can only dream of a 6 hr time. scared but determined to do it.yr account made me cry such a wimp. Sorry I made you cry, it was quite an emotional day for me as I went on such a journey to get there. I do remember that feeling of a tiny incline feeling like the alps but you can overcome that, you sound very determined. I feared 2 things about last year, the broom wagon sweeping me up because I wouldn’t be fast enough and the hills. The pace is overall about 2-3mph faster than your normal average speed because of the closed roads. Boris did it in 8hrs so that’s a pretty good benchmark to take your speed worries away. The hills aren’t so bad, you just need to do a bit of training to practise riding hills when you’re tired because they come at around 55 / 60 miles but even so they’re still not that bad. Box Hill is a pleasure to ride, Leith Hill is a bit harder but there’s so much support from the crowds cheering you on you’ll do it. Just get out and train when you can and most of all have an amazing day. hi,yes my worries are the same as yrs were, getting stopped for being slow and the hills are due just when i get tired at the mo.my average is not as fast as id like, but im hopeing i can bank some time initially when its flat and adrenaline at the end will get me to the end. lol re Borris,i keep telling myself that, to start i wantd a 6hrish time,then 7ish was more realistic and now i just want to finish! lots of worries but am determined and want to try enjoy it. will keep an eye on yr updates. Hi, I’m doing Ride-Prudential too. 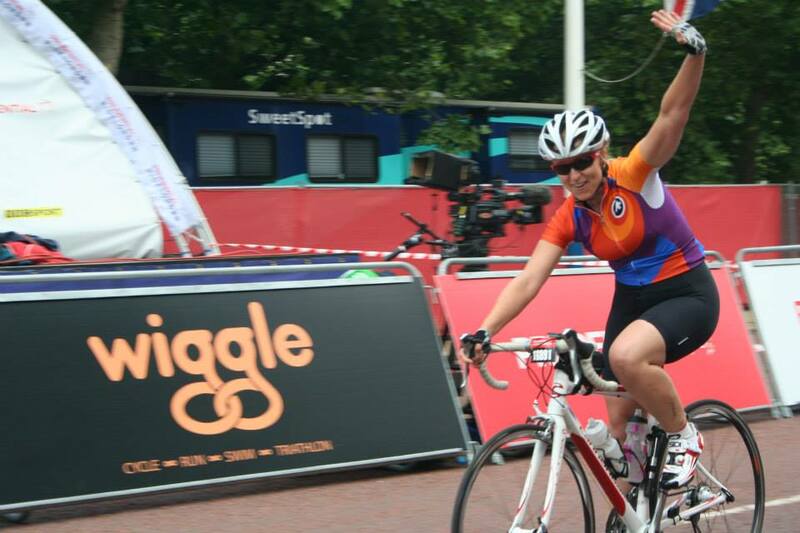 I’ve also signed up for London-Brighton night ride (60 miles) on July 12th so will be an ideal practice run! I often wonder what possessed me to enter as my average bike route used to be 7-10 miles (beginning of last year) and up until quite recently I had only reached about 20 miles! I didn’t realise there were so few women doing it and hadn’t even thought about it to be honest! I’m a 41 year old mum of two young children (and two grown up ones too) and feel completely selfish every time I train and leave the kids with my husband yet again! I keep trying to tell myself that most blokes in my shoes wouldn’t give it a second thought! I’m worried about my back, hip and knees holding up on such a long ride and where the loos are! 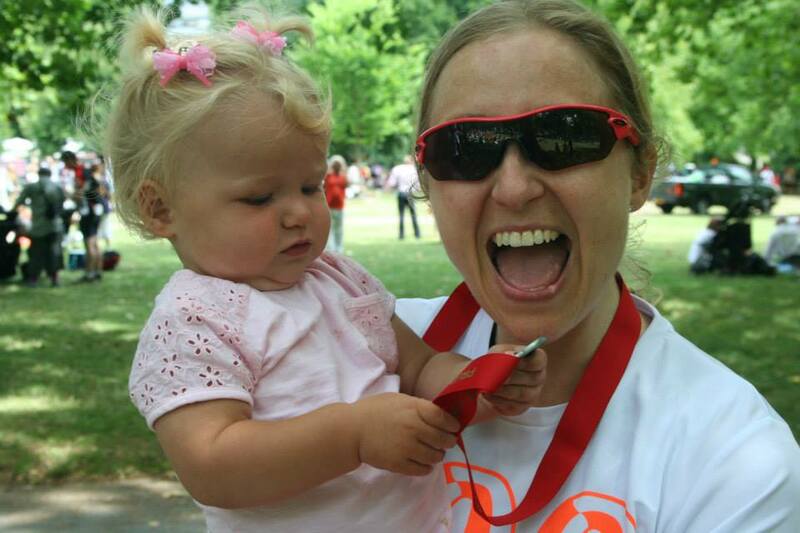 I felt terrible guilt last year, I was leaving my 6 month old baby at home regularly with my Mum so I could train. I’d have all these thoughts about being the most awful mother and that I should really be at home with Savannah, I would often think about turning back as I started to ride but eventually I made a more positive switch in my mind. I decided I was being a positive role model for her, showing her that her Mum was doing something good, being healthy and happy. I really had nothing to worry about at all. She chats away now about Mummy’s fast bike, when she sees cycling on TV she says it’s Mummy and if you ask her if she’s going to race on a bike one day she says yes. She’s not even 2. As for loos there’s plenty along the route, I mention this in my top tips post. There’s some at each feed station but there’s also random single porta loos along the route. I hope your kids are really proud of you, keep us posted with how your training is coming along and good luck with your night ride, that sounds really fun.